Gait and cognitive deficits are common in multiple sclerosis (MS) and are negatively affected during dual-task walking. Treadmill (TM) training has been previously used to preserve locomotor activity in MS. Virtual reality (VR) engages the user in cognitive and motor activities simultaneously. A training combining TM and VR has been successfully adopted in several neurological diseases, but not in MS. This study aims at investigating the feasibility of a TM- and VR-based rehabilitation intervention on gait of subjects with MS. Eight persons with relapsing-remitting MS were recruited to participate in a six-week TM- and VR-based training. Gait analysis was performed both in single and dual task conditions. Clinical tests were used to assess walking endurance and obstacle negotiation. All the evaluations were performed before, immediately and one month after the training. Gait speed and stride length improved in dual task post-intervention and were retained at follow-up. An improved ability in negotiating obstacles was found across the evaluations. 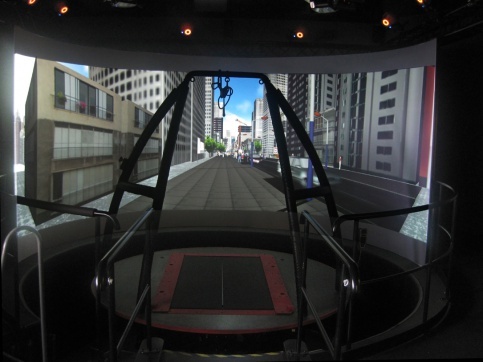 TM- and VR-based training is feasible and safe for MS subjects with moderate disabilities and may positively affect gait under complex conditions, such as dual tasking and obstacle negotiation.